TEN NI TSŪJITE TEN YORI AMAKUDARASE TAMŌ. ON MISUGATA O ARAWASE TAMŌ. 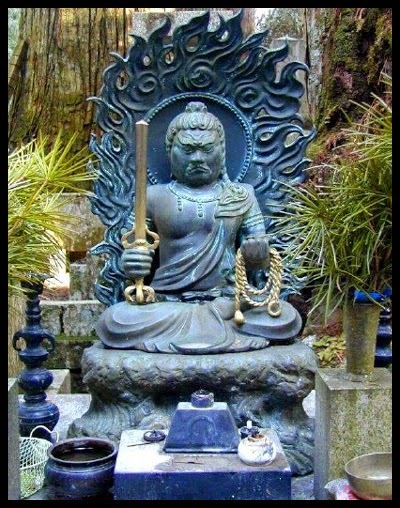 KAMI WA SHŌJŌ NASASHIME TAMŌ. There is a special deity for each part of the body. Fudo is mentioned for the hair and stomach. 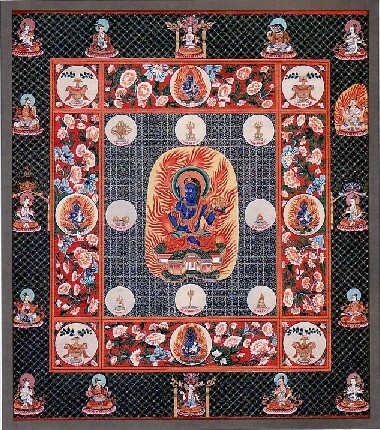 Fudo Myo-O is seated in the middle. 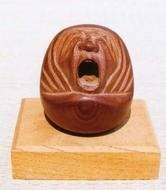 "I will place a seal on the ogress' arm by chanting the Ninnogyo"
Ninnō-kyō is a bible of the Shingon school of esoteric Buddhism on rituals praying for peace and protection for a nation. This is part of the iconographic drawing collection “Kakuzen-shō” compiled by Kakuzen, a famous iconograph scholar monk of the Shingon sect. It shows records of rituals and rules related to Ninnō-kyō. While there is an inscription at the end saying “1183”, it is probably a copy from a somewhat later period. Formerly owned by Tōji temple, Kyoto.